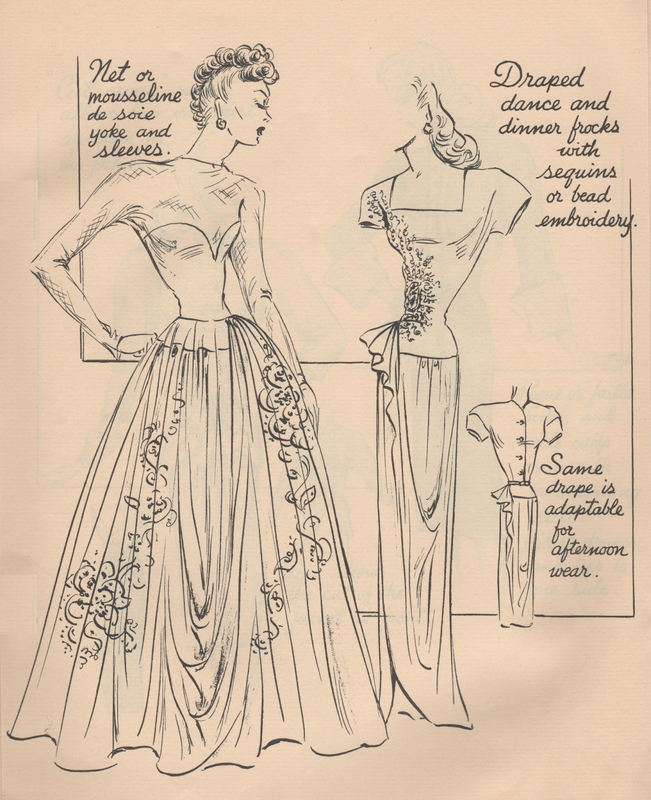 This Originator sketch from Spring 1946 features two beautiful concepts for evening wear, each featuring draping. On the left is a full-skirted evening gown with a cowl-like drape just left of center front and below the knees in the skirt. A bit subtle, I think! The skirt is also accented with flowing sequins or bead embroidery. On the right, a cascading drape on the right hip and small cowl-like drape above the right knee add elegance to this slim frock for dinner or afternoon wear. Sequins or bead embroidery add extra spark & dazzle. Note that the full-skirted evening gown has a sheer yoke and sleeves, and a decollete under-bodice with sweetheart neckline. Gorgeous!